Students need time to adjust when they come from their hinterland hometowns to JNU, the other Red Fort of Delhi. For Kanhaiya Kumar, the JNU students union president facing the sedition charge, there was little change in air, since he comes from a place known as Leningrad of Bihar. Begusarai, in the Ganga plains and known for its rivers – Burhi Gandak, Balan, Bainty, Baya and Chandrabhaga – earned this epithet in 1956, when it elected its first communist MLA, Chandrashekhar Singh of CPI. Singh, born in 1915, was the son of Ramcharitra Singh, a powerful Congress minister in the regime of Sri Krishna Prasad Singh. As folks gathered at a snacks shop recall the legend of Chandrashekhar Singh, they get animated, cut each other’s sentences, add layers of details. They tell me that the Congress once denied the ticket to Ramcharitra Singh in 1957 on the pretext that he had allowed his house to become a den of leftists. He, however, contested as an independent against the Congress candidate and won the election. It turned out to be the last election he fought, and his victory made his son more famous. Singh’s rebellious streak may have something to do with the fact that his ancestral village, Bihat – part of Begusarai, was the first in the region to join the freedom movement. Old-timers in the town pass on what they heard from their elders, that the British had a tough time fighting the satyagrahis of Bihat. Singh studied at the Banaras Hindu University (BHU), where he was influenced by Mahatma Gandhi but later as he came in contact with leftist leaders, he joined the communist movement. People remember him as a firebrand orator who used his skills effectively to attract people with an intellectual bent of mind to the communist fold. Singh later became a minister in the first Jan Sangh-led non-Congress government in Bihar in 1967. He was elected from this constituency (then called Barauni, now Teghra) that remained a CPI bastion till 2010 – when the Nitish wave broke the record. The Bihar state unit of the CPI was formed in 1939 at Sudhir Bose’s residence in Munger. In those days, Begusarai was a sub-division of Munger; it became a district in 1972. 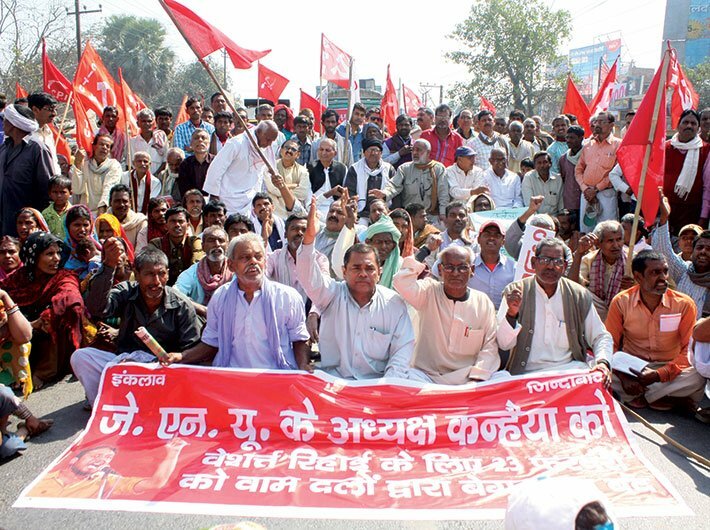 In Begusarai, CPI became popular with the January 1959 labour strike. The agitation lasted 17 days and ended successfully as the government agreed to give regular jobs to 5,500 locals who had worked for a year in construction of the bridge over the Ganga. The 5,500 government jobs brought a degree of prosperity in the region. Comrade Chandrashekhar Singh, people knew, had met railway minister Babu Jagjivan Ram in Delhi to press the workers’ case. “[CPI’s] Growth in the region was fast. Intellectuals, professionals and landlords all came to the party fold. Begusarai was now called Leningrad or junior Moscow,” says Ramvilas Singh, a local social activist. The communists also gained popularity here with the land reform movement. In 1922, Swami Sahajanand had launched his Bhumi Sudhar Aandolan against the landlords and the communists later aggressively pursued this move in Begusarai. They soon emerged as saviours of the poor and the landless against the powerful and rich landlords. “The role played by Chandrashekhar Singh in redistribution of land made him a hero for the have-nots; he was seen as someone who would protect them against the oppression of the rich landlords. This made the Communist Party a natural choice for the locals,” says former MLA Rajendra Singh of CPM. In the early 1960s, the communists started an agitation for better wages and work conditions in the Barauni refinery. “Chandrashekhar Singh’s speech during this campaign was so powerful that workers started pelting stones on police. Several workers were injured in the ensuing lathi charge and a dozen of them died in police firing. Singh and I managed to escape,” recalls Rai Ramanand, who was once the great leader’s deputy. In the 1969 land acquisition movement, the CPI and CPM joined hands for rehabilitation of dalits. This phenomenon helped in expansion of the left parties in the region. The 1964 split in the CPI saw top leaders like Brahmdev Rai, Sukhdev Singh, Kedar Rai, Siyaram Yadav and Vidyanath Mahto moving to the newly formed CPM. Begusarai witnessed escalating tensions and soaring rivalries resulting in murder of many political activists. Ganganand Rai and Bhaso Kunwar, who had joined CPM, were killed allegedly by the rival comrades. CPI’s MLA Sitaram Mishra also died in the violent rivalry. With Jayaprakash Narayan’s Total Revolution movement in 1974, the socialist parties became powerful in Bihar. This phase saw the rise of leaders, from the backward communities, like Karpoori Thakur, Shyam Sundar Singh, Kapildeo Singh and Ramjeevan Singh. They became the poster-boys of an anti-Congress movement. Yet, during all these upheavals, Begusarai remained firmly behind the communists. Yet, in later decades, the communist base here was withering away. Till 2005, CPI had two MLAs from Barauni and Bakhri. In 2010, Awadesh Kumar Rai was the lone CPI member in the assembly. In the last assembly elections (2015), CPI(ML) won only three seats. “The socialist parties started using caste to widen their support base. Also, the 1990s was the time for the rise of religion-linked politics and communism started losing its hold,” says Rajendra Rajan, a former CPI legislator. Besides, several landlords joined the party and started giving donations to it, to save their land. A party that had championed the rights of the tillers against landlords was appearing to have switched sides. “The party talks of a classless society but it got into the caste politics by joining Lalu Prasad for the lust of power,” says SN Singh, a retired school principal, who was once a staunch supporter of Chandrashekhar Singh.